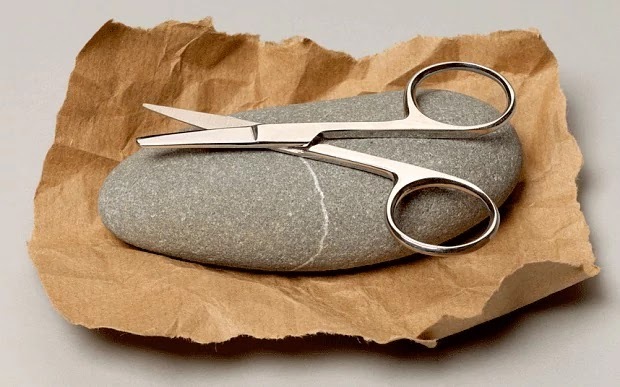 Leave a Comment on Rock, Paper, Scissors. Garbage. Okay, I admit it. I have no clue how Rock, Paper, Scissors works. I mean, I know Scissors beats Paper. It can cut paper, so it wins. But what’s the deal with Rock? I mean, doesn’t Rock win all the time? It can beat the bejeebers out of Paper, certainly, and can absolutely destroy Scissors. So why doesn’t everyone throw Rock all the time? Okay, I just looked up the rules. Really, I did. Seems that Paper “covers” Rock? So Paper wins over Rock? How lame is that? Rock, what, just sits there and lets itself get covered? What a whuss. That’s it. I’m done with Rock, Paper, Scissors. It’s One Potato, Two Potato for me all the way! Previous Entry Getting Ready to Rumble! Or, You Know, Write.